The air is beginning to tingle and there is a buzz simmering through golf club chatter throughout the world. We know its going to be good but we do not know quite how great it may be. The Ryder Cup is less than three weeks away and the World in Sport has decided to tantalise your pallets by giving you a taste of what is about to come by reliving the best Ryder Cup moments; today with the USA. The cherished Golden Bear has had his fair share of must hole putts throughout his career and so as Tony Jacklin stood needing to hole a missable, breaking 6 footer on the last to tie the Ryder Cup, Jack Nicklaus knew the strain he was feeling. Not wanting to put Jacklin under such torrid pressure and to avoid a USA win on a mistake, Nicklaus gave him the putt resulting in the first ever Ryder Cup draw. The USA was furious as the world applauded a fine piece of sportsmanship from the man who is till the all time top Major winner. Away from the camaraderie of Nicklaus in 1969 comes just plain and simple great golf. Standing on the 17th with a 45 foot putt to keep him in it against Olazabal, Leonard smashed the ball into the back of the cup. Forgetting how Olazabal still had a 22 foot putt to halve and keep his advantage, the crowd and Leonard’s USA team mates exploded in ecstasy and went wild. Under the backdrop of the euphoric atmosphere, there was no surprise when Olazabal missed ensuring the half point the USA needed to win the Ryder Cup. A pure example of the brilliance of match play and how fast things can turn on you. The ‘Golden Generation’ of golf were dubbed The Untouchables as they followed through with their much promised and hyped talent. Unlike England’s footballing ‘Golden Generation’, this American team consisting of infamous players including Nicklaus, Watson, Trevino, Floyd, Miller and Kite crushed their opponents in unmatchable form. The 18 1/2 -9 1/2 win against a European team that had won just two years before was memorable to say the least and was perfectly summed up by Larry Nelson completing his 100% record of 9 matches and 9 wins. Perhaps the most underrated player in golf having been never considered one of the ‘Big Three’ -Jack Nicklaus, Gary Player & Arnold Palmer- acclaimed for popularising golf, every one of Billy Casper’s performances in the Ryder Cup for the USA should be considered a legacy of USA’s best moments ever. A force in the individual game as well with 3 major wins in arguably golf’s greatest era, Casper transcended this form into the Ryder Cup. A formidable player, he played in 8 matches and never lost, on top of being the best putter of all time, cementing his place in Ryder Cup lore. There is almost unanimous agreement that Valhalla was the best Ryder Cup in history, at least on US soil. Paul Azinger was masterful in devising the USA’s plan to dismantle Europe and earn their first win since 1999. But for all the drama and technical play, Boo Weekley’s riding of horse down the first helped us remember the sheer joy golf and the people involved can bring. With the USA’s nine years of pain causing high tensions on home turf, Boo dispersed the nervous atmosphere by skipping down the surface riding his driver as a pretend horse. The jovial act caused the local crowds to woop with their local boy. He may have slipped down the radar into obscurity, but Boo Weekley helped cement himself and the 2008 Ryder Cup into our memories. No best moments list could be complete without a bit of the weird and wonderful. The world may remember Bernhard Langer missing the putt that lost Europe the 1991 Ryder Cup, but nobody recalls the build up quite as much on that 18th that concluded ‘The War by the Shore.” With the match firmly in the balance, Hale Irwin seemed to give Europe break they needed to take the Ryder Cup for the first time on US soil as he pulled his drive left into the crowd. As the USA gasped with what seemed to be their fate sealed, the ball smacked into a spectator, flying back perfectly into the middle of the fairway. The rest they say is history, that is until you realise that the person it hit was none other than Kathy Jorden, a public relations specialist with the PGA of America. Surely a decent pay rise must have followed as she helped the USA win the Ryder Cup in a rather unexpected kind of way. It was not every day you could see someone as passionate about the game as Payne Stewart. He certainly had the drive; dressed in the red, blue and white of his beloved USA, Stewart was undoubtedly determined to make the most of his opportunity at the Ryder Cup and win. But with the Ryder Cup clinched for the USA, the veteran Ryder Cup player conceded his singles match against Montgomerie to put the European out of his misery after a torrid treatment by fans. This magical moment of sportsmanship was a heartwarming gesture for an infamous champion. Stewart was tragically killed in a plane accident only a month later at the age of 42, but his sportsmanship, fair play and unique talent were epitomised in this moment. Heading into the final day of the 1999 Ryder Cup at The Country Club, Europe were leading by a healthy 10-6 margin. History suggested that this was an insurmountable deficit for the USA to overcome. Nevertheless, the USA team captain Ben Cranshaw believed and he wasn’t scared of saying it, giving an awe-inspiring speech to the press and crowds the night before the final singles. The line that most poignantly sums up his captaincy in that final day was “I’m going to leave y’all with one thought. I’m a big believer in fate. I have a good feeling about this.” Legend has it Cranshaw launched into an even more heartfelt speech in private as well as requesting President Bush to address the team. If so, it certainly seemed to work. David Duval perfectly epitomised the incredulous comeback and the emotions involved as he ripped apart Jesper Parnevik 5 & 4 before breaking into an unprecedented display of joy and disbelief. The dominance of the USA seemed to reach a watershed in 1977 as they hammered GB & Ireland 16 – 11 at Royal Lytham. The extent of their power in the competition reached such a pinnacle that the decision was made to extend the eligibility criteria of USA’s opponents to that of Europe as well as GB & Ireland. The hope of tournament organisers was to make the event more competitive, with Jack Nicklaus even saying ” It is vital to widen the selection procedures if the Ryder Cup is to continue to enjoy its past prestige.” When the 1979 Ryder Cup arrived at The Greenbrier there was a real excitement at the prospect the USA could be finally defeated, especially with players such as Seve Ballesteros in the fold for the Europeans. It wasn’t the case though, as the USA put in a sterling performance crushing Europe 17 – 11 telling the world by doing so they were not going anywhere. Ben Cranshaw may have been inspirational in leading the USA to victory in 1999, but in 1987, whilst playing for the USA, he was infamous for another reason he probably is less proud of. Losing to Eamonn Darcy on the 6th hole, Cranshaw seemed to quite literally snap under pressure, breaking his putter in half. As a result, he was forced to absurdly putt with his sandwedge and 1 iron. 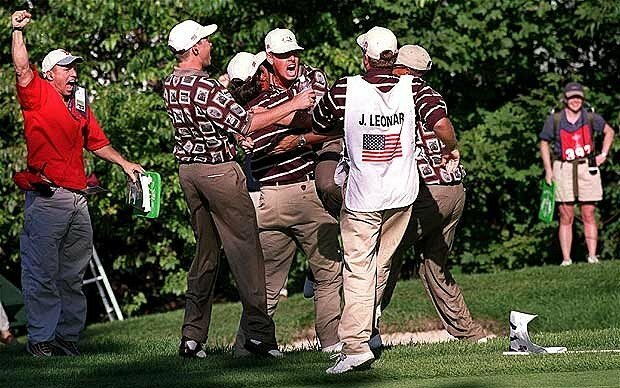 He went on to lose the match but it had to be one of the most ridiculous and amusing sights in USA Ryder Cup history.